Lots and lots of things have been happening on the farm recently. I figured I’d write this week about events rather than using events as a thinly veiled gateway to writing about politics. So, what’s going on down on the farm? 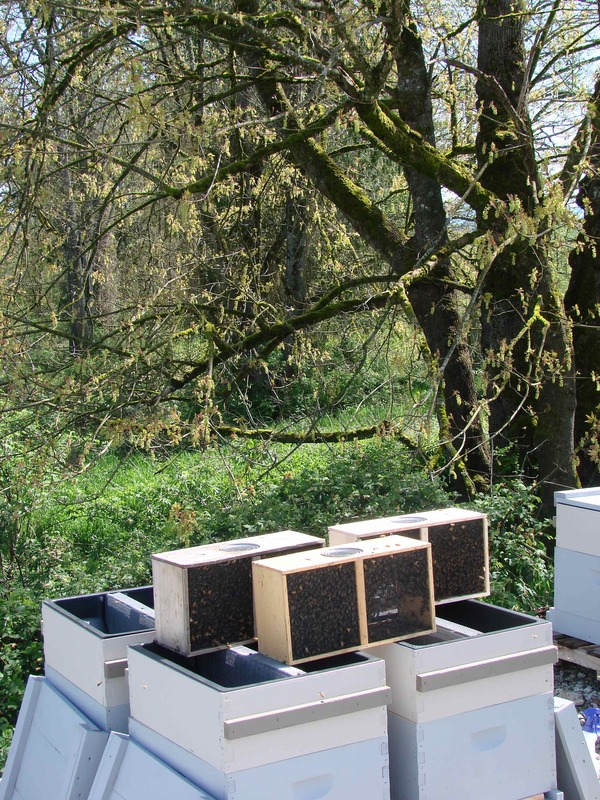 First of all, 16 hives of bees arrived on the farm yesterday. At a wonderful dinner last year at the Boat Street Cafe, we met Corky Luster, who owns the Ballard Bee Company. We got to talking with Corky and he asked us whether he might set up a few hives at Local Roots. He’d do all the work, and we’d get a bunch of honey. Hmmmm, tough decision, buuut…. ok. Watching Corky (from a safe distance) put the bees into these hives was amazing. He was wearing a bee-keepers hood, but no gloves, and there were thousands of bees buzzing about and learning their surroundings. 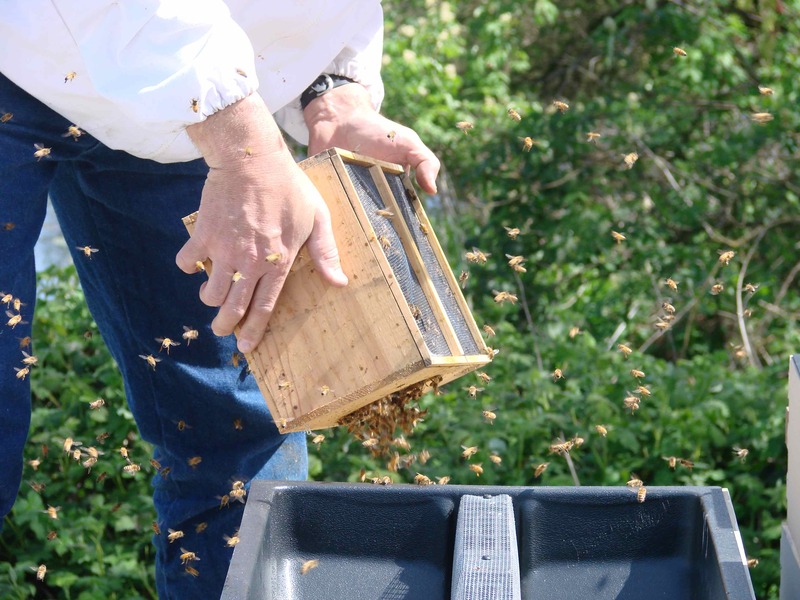 Corky would take each hive, contained within a wood and wire box, and simply dump the bees into the hives. In they went, and then out again they’d come, flying around above the hive. The day before the bees arrived, we were swarmed by high school kids. As you may recall, we are partnering with Global Visionaries – a non-profit group through which high school kids earn service learning credits first in the Seattle-area and ultimately in Guatemala. Apparently, we are service learning. 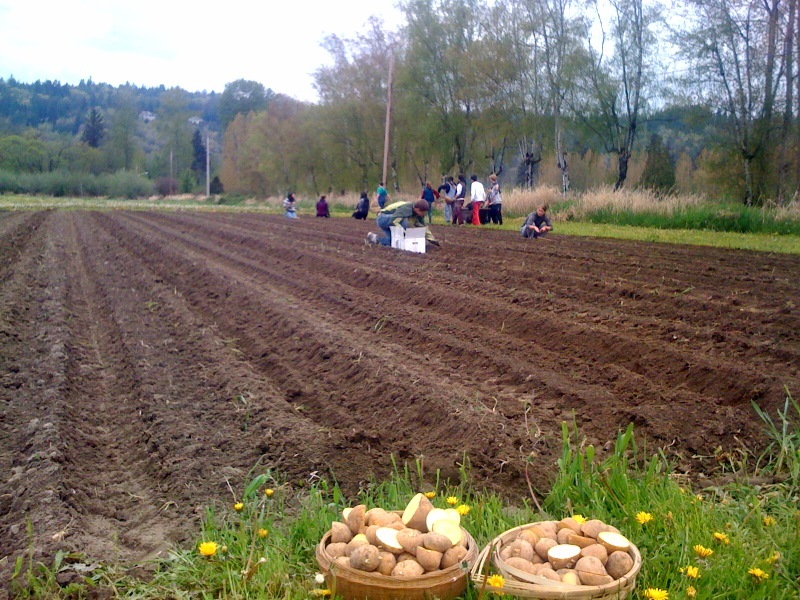 The learning we did on Saturday was to plant 200 lbs of potatoes – Ozette (of Makah Tribe fame), Yellow Finn, All Blue, and Red Pontiac. Then, as usual, we tried to teach them how to cook something. This week, it was home-made flat bread, sauteed radicchio and nettles, polenta from corn they shelled and ground themselves, and pop-corn they shelled themselves too. Most of them had eaten (or at least heard of) polenta or corn-meal, but shelling and grinding the dried kernels into flour was certainly new to them. Until this winter, it was new to us too. What Siri and I realized after our very first meeting with Global Visionaries last year is that to really engage someone’s interest, you need some shared point of reference. With many of the (adult) people we interact with, it’s food, cooking, food politics, etc. With high school kids, we quickly realized that we share less common ground than we had thought. So, we figured we’d cultivate common ground by teaching them how to cook. And what better way to simultaneously do that and tacitly expand their understanding of what food is and where it comes from than by starting with the rawest of raw ingredients. 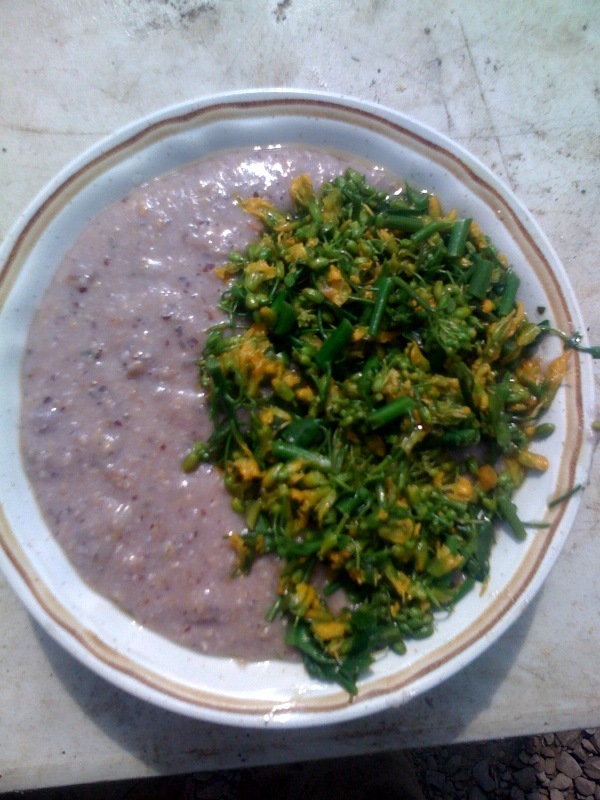 Last time they visited the farm, we winnowed rye and made a rye berry salad. This week, they shelled and ground corn and cooked polenta. While Siri and I cook and talk, they are variously paying attention, discussing who’s going to prom with whom, gossiping about so-and-so, and helping chop, stir, sautee, etc. My suspicion is that the food we are cooking is a bit too out of the norm to stay with them for the immediate future. But I hope that when they start shopping and cooking for themselves, these brief interactions with the rawest ingredients will have stayed with them and they’ll remember that they don’t have to buy instant cornmeal. They can cook it from scratch. Here’s a better recipe for polenta than I could ever concoct from the Orangette blog. If you want to try our amazing Hopi Blue flour corn, as seen in the picture above, give me a holler and get yourself a flour mill. 2. Boil in well-salted water until done. I like mine more al dente, so they pop when I chew them, Siri likes hers softer. 3. 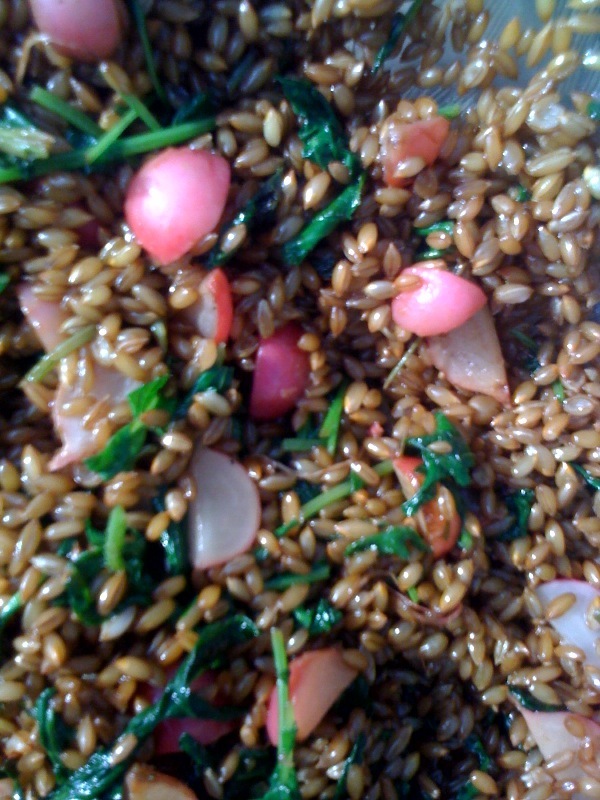 While the rye cooks, halve or quarter radishes and/or turnips, saving their greens. Chop green garlic any way you like. 4. Sautee the radishes and/or turnips with the green garlic. When the cut-side of the root turns brown, roughly chop the radish/turnip greens (I like to chop the stem very finely and the leaves roughly) and add them to the pan. Stop cooking once the greens have wilted and turned bright green. 5. When the rye is done, toss it with lots of olive oil, your favorite vinegar (I like sherry vinegar), and some lemon juice. Add fresh thyme or marjoram and chives, season with salt and pepper, and serve.